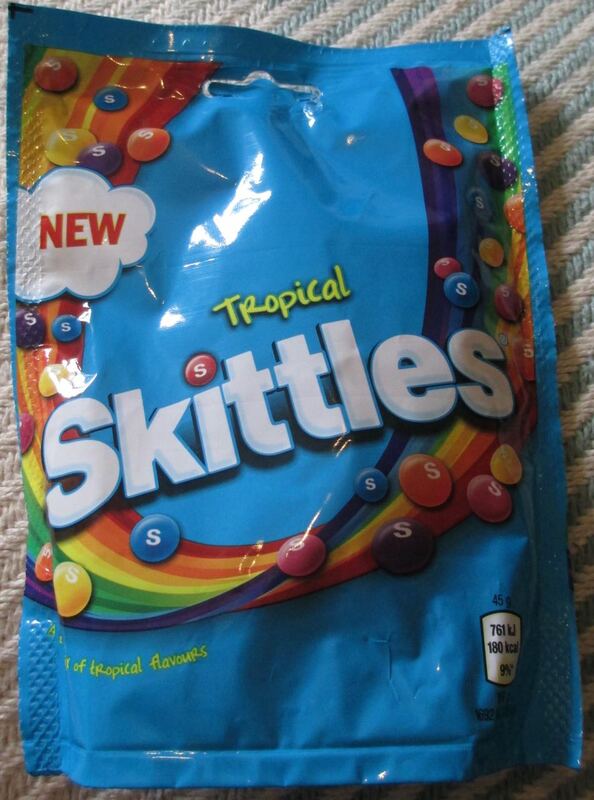 It seems bizarre that these Skittles Tropical flavour are new. It seems like there should have been a Skittles Tropical flavour in the UK years ago, but we sometimes get a little forgotten where snacking flavours are concerned, either that or manufacturers sometimes don’t believe we’ll like a slightly adventurous flavour of something. Anyway there were quite a few flavours in the re-sealable bag, starting with a sweet pineapple flavour for the yellow Skittles. You’ve probably guessed that the orange coloured Skittles were indeed an orange flavour, however they did pack quite a sweet and zesty punch that suggested mandarin. I wasn’t absolutely sure what blue was, but it tasted a little like blueberry and cherry combined, which are two of my least favourite flavours to court one another, especially in a sweet packet. I really didn’t like the blues. The pinks were watermelon flavour, but tasted slightly chemically, but not enough to put me off them. Have I mentioned that I just didn’t like the blues at all? Finally the purples were a passion fruit flavour, with perhaps a hint of blackcurrant. These Skittles Tropical were very nice indeed, asides the blues, but I’m feeling a little less adventurous and preferred the oranges and yellows! 174g bag with 180 calories per 45g serving, having 1.9g of fat 0.01g of salt and 39.9g of sugar (well, they are sweets!). See photograph for ingredients.